Leek, Garlic, Onions and Chives. It is best to keep the area around a mound of loganberries mowed to make picking easier. Prepare a sturdy frame of wires against a wall or on posts. Plant with the crown 8cm below soil level and apply a thick mulch. Cut the stems to a strong bud. After harvesting, cut 2 year old branches to ground level. Healthy loganberries will bear for ten to fifteen years or more. Pick when ripe. 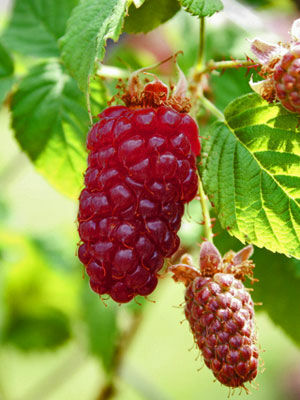 Loganberries do not ripen all at once, and should be picked weekly through the second half of summer. Net to prevent bird damage. Plant a thornless variety to take the pain out of harvesting.